Last year my friend, Greg Tehven, the organizer for TEDxFargo, invited me to give a TEDx talk at his 2018 event. That’s about 15 days away and I’m almost ready. I said no, at first. Then I caved. See, I’ve never had ‘Giving a TED Talk’ on my list of things to do in life. My role at a TEDx is to help others get their ideas out to the world. I do that as a producer, creating everything necessary to have a perfect environment for them so when they step into the red circle, it’s magic. Now it’s my turn. I said yes because for the past two years I’ve been interviewing organizers, speakers, and others in the TEDx ecosystem, to learn and share best practices. And it’s time for the shoe to be on the other foot. I’ve been keeping track of my road to the red circle because I thought it would be interesting to understand what it’s like to be a speaker at an event, and not the organizer or producer. This experience has already increased my empathy a thousand-fold. It will make me a much better producer as a result of this journey. I’ve been executive producing TEDxSantaBarbara since 2010 and have watched my wife coach 73 speakers, not including the 13 from this year’s event. I understand how challenging it is and I watch from the sidelines as she coaches them towards their Core Idea (the one worth spreading), She is there when they experience the various crisis that comes up, including the one about not being good enough, not being ready, not happy with the 10th draft, etc. Guess what? I’m enjoying all of those same feelings myself. Thankfully I have a world-class coach right with me, yet I thought it would be helpful to have additional help along the path. I have a fitness coach, Traver Boehm, who has helped me stick to a diet (no sugar, wheat or dairy) so I’ll feel light and energetic when I step onto the stage. He’s also been enthusiastically cheering from the sidelines. He developed a movement and stretching routine I go through each morning. He was on our stage in 2016 and has enjoyed his own journey, so knows what it takes to be your best self on the big day. I have a performance and story coach, Garrett Blair, of Collabreations, who studied directing at Columbia and understands audiences and how to deliver, and land, lines like I’ve not heard before. He has taught me to understand how I want the audience to feel about a line, rather than try to be ‘excited’ about the line myself. We’ve been working twice a week for the past month, and it’s sinking in. I asked him how long it takes… he’s been acting since he was six, I’m 65 this week. I have some catching up to do. I have a visuals coach, Samantha Nienow of Red Zest Design, who I had the pleasure of interviewing on my Hacking the Red Circle podcast. She’s taken my line drawings and put them into an animation that will be the perfect supporting player to my talk. She’s also going to be the one introducing me in Fargo. It’s been great working with her. I have a quarterback for the entire process, Kymberlee Weil, my lovely wife also known as the Strategic Samurai. She’s coached over 200 TED talks around the world and started working with me months ago, taking long walks at our favorite beach, auditioning ideas and the stories that go with them. It took a while to come up with the one I’ll give at TEDxFargo. She has been instrumental in making sure that my Core Idea is solid and memorable. One of the things I had not expected was how the thinking that goes into the talk, the crafting of language, the focus on the lesson to teach, has crystallized my thinking and has forced me to systematize a method I’ve been using for years to solve problems. This process has forced me to get my ideas and methodology down into as tight a presentation as possible. The TED talk format (under 18 minutes, in my case, around 12) turns a lifetime of work into poetry if you let all the extraneous words go. I have been getting emotional support from TEDx organizers that have become friends over the years. One, Randy Bretz, is driving from Lincoln, Nebraska, to watch the talk. No pressure, right? This road to the red circle has been memorable. 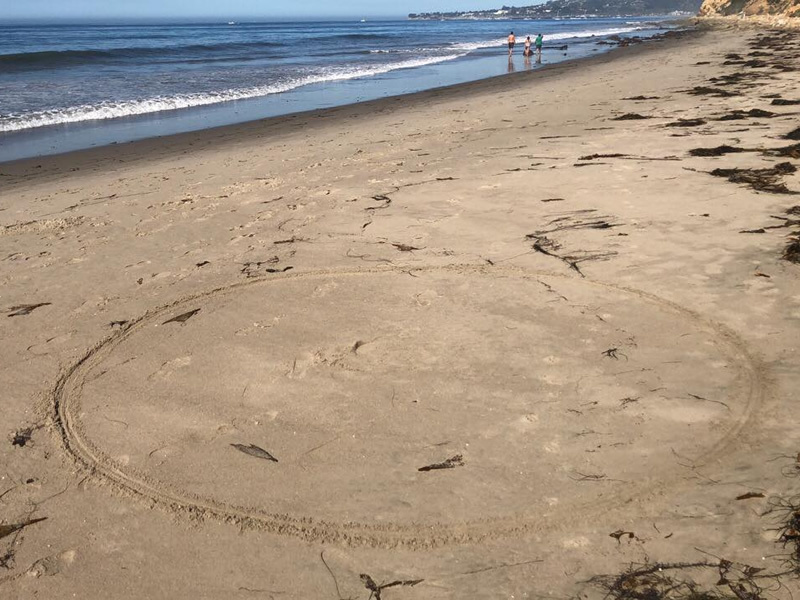 With 15 days to go, I know each day at 7 am when I am standing inside my practice circle at Butterfly Beach here in Santa Barbara, I’ll be treasuring every minute I have to rehearse. I have 12 minutes to launch an idea that is definitely worth sharing. Mark, you have already inspired me, and I haven’t even heard your idea on the TEDxFargo stage. I’m making a special effort to be in Fargo for your time in the red circle. Please know that I’ll be in the audience not so silently cheering for you. So much inspiration and great ideas here to help coach my speakers! Thank you! Randy, I am so looking forward to finding your smiling face in the audience while I’m speaking.